Share Outlook Calendar without Exchange Server. Microsoft Outlook Calendar sharing tool. Share and synchronize Microsoft Outlook Calendar folders without a server. Group Scheduling. 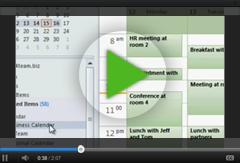 Sync Outlook Calendar between PCs and share Calendar with colleagues or friends. If you are looking for a quick and easy way of sharing and synchronizing your Microsoft Outlook Calendar or creating and sharing multiple Calendars, this program is for you. How to share Outlook Calendar? You just need to install ShareCalendar on your computer running Microsoft Outlook 2002/2003/2007/2010/2013 and on computers of your preferred teammates, and after a few clicks their calendar folders information will be synchronized each time you update the shared folder on your PC. Your partner will receive the updated Calendar items (appointments, meetings, events) by regular e-mail. You are able to update and manage all your shared Calendar folders offline or using any Internet connection. It is an easy and effective solution for remote companies and groups. 7 Reasons to Buy ShareCalendar and why it is better than Competitors' Products. Create, edit, and view your friends' or co-workers' calendar just as you do with your own. Create Outlook group (public) calendar folders. ShareCalendar's Outlook group folders make group scheduling and coordination easy. Synchronize your personal or group (public) Calendar folders with your second desktop or laptop allow your family and coworkers to subscribe (view only) to selected folders.You Group Calendar will always be up to date. ShareCalendar's Outlook public calendar makes group scheduling very easy. Create a group calendar for your team, friends or family. See the appointments of multiple people within a single calendar view. Sharing and synching the Calendar data between different Outlook versions of 2002, 2003, 2007, 2010 and 2013 is not a problem. You don't need to worry what Microsoft Outlook version is installed on your second or your friend's PC. Share and access yours and your Contacts Calendars Free/Busy time via the Scheduling Tab of the Appointment / Meeting Request or use Group Schedules in the Microsoft Outlook Calendar folder without Exchange Server. With the Shared Calendar this feature will help you schedule all your meetings and appointments. Always know your co-workers' and friends' free/busy time without disclosing the subject and private details. Learn more how to use Microsoft Outlook scheduling here. Let people you work with to see your calendar. Make your calendar as public as you want. Subscribers will be able to see just the information you allow them to see.